Building upon its $152 million in community benefit provided annually, Mission Health’s Community Investment program is now providing $869,000 in cash contributions to 17 agencies across Western North Carolina to help residents Be Well, Get Well and Stay Well. The grants are focused on priority health needs identified via a collaborative community health assessment process. For the 2017 funding cycle, the focus areas are: Food Security, Healthy Living, Behavioral Health & Substance Abuse, and Interpersonal Violence. Funding priority was given to programs working in one or more counties that are collaborating with other organizations. One of those partnerships involved YMCA of Western North Carolina and MANNA FoodBank. MANNA FoodBank’s Chief Executive Officer Hannah Randall said the vision of the Mission Health Community Investment program has fast-tracked the agency’s work to provide nutritious food directly to WNC residents who are most at risk for food-related health issues. The agencies and programs funded include: All Souls Counseling, Asheville Buncombe Institute of Parity Achievement (ABIPA), Bountiful Cities, CARING for Children, Children First/Communities in Schools of Buncombe County, Haywood Street Congregation, Helpmate, Homeward Bound of Western North Carolina, Madison County Health Department, MANNA Foodbank, MemoryCare, Mountain Child Advocacy Center, Pisgah Legal Services, REACH of Macon County, The Council on Aging, YMCA of Western North Carolina, and the YWCA of Asheville and Western North Carolina. In addition to providing these direct program grants, Mission Health contributes more than $152 million annually in community benefits through charity care, unreimbursed medical education and research costs, and unreimbursed costs of treating Medicare and Medicaid patients. In a time when most kids have video games and the latest trendy toys on their holiday wish lists; the children in YWCA of Asheville Primary Enrichment Program (PEP) will be adding a new book to their list of gifts for the Holidays. Thanks to a generous donor, the students in YWCA PEP after school are getting the chance to pick out a book of their choosing from Malaprop’s Bookstore. One of the best ways to develop children’s reading ability and foster a lifelong appreciation for reading is to encourage kids to read at home. For many children, however, there are not any books at home for them to read. YWCA PEP staff and volunteers work hard to ensure that all students get the academic support they need including homework help and individualized tutoring. This opportunity is such a gift for many of children in YWCA’s PEP program. The donor, Joel Adams, is donating the books to the children at the YWCA in honor of his clients at Raymond James Financial Services. Mars Hill University honored 67 students who completed their graduation requirements during the summer or fall of 2016 during its commencement service Friday evening, December 16, 2016. The graduates included Mars Hill's first students to receive their bachelor of science in nursing (B.S.N.) degrees. "Mars Hill has taught me that just living and surviving in this world is not acceptable; we must find ways to live as part of a world community that sees every soul and every culture as important," said Daniel Godfrey, a religion major from Monroe, N.C., who was one of the student speakers on the program. Adult and Graduate Studies graduate Jessica Anne Bolet, a business management major from Arden, N.C., also spoke; as did Stephanie Silver Shelton of Mars Hill, N.C., who gave the invocation. Shelton is one of the three nurses who completed the R.N. to B.S.N. (registered nurse to bachelor of science in nursing) program through the university's new Judge-McRae School of Nursing. (Shelton also is Mars Hill University's director of medical services.) Music education major James Brett Anderson of Weaverville, N.C., presented a musical selection on the euphonium. Keynote speaker for commencement was one of the namesakes of the nursing school, Rev. Linda Judge-McRae. Judge-McRae and her husband, Norman McRae, made significant contributions to the effort to start Mars Hill's nursing program. The McRaes are Mars Hill graduates who own and operate Caris Healthcare, a hospice care provider based in Knoxville, Tenn.
Judge-McRae talked of teachers and public figures who were influential in her life, and through their examples gave the graduating class encouragement for their post-college lives. Quoting her high school Latin teacher's refrain that, "The least you can do is the best that you can," Judge-McRae challenged the students to persevere, even through life's difficulties. "But I do know this... and I know it with great confidence: that we worship a God of second chances, and there's a chance for me to do my best, be my best, and give my best in the days that follow," she said. "And I challenge you, graduates, to do the same -- it's the least you can do." Nineteen students received bachelor of arts degrees, one received a bachelor of music, 39 received bachelor of science degrees, and five received the bachelor of social work. 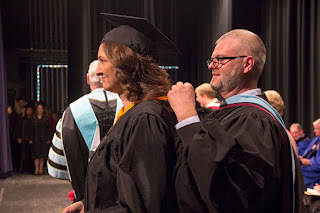 The graduating class includes students in both the university's traditional undergraduate program and its Adult and Graduate Studies program for working adults.